On-trend. On-time. On-price. 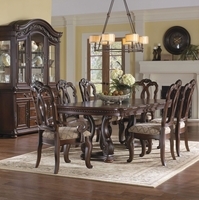 Samuel Lawrence Furniture continues to adapt to the ever-changing needs of today�s value-conscious family. SLF designs and manufactures bedroom, dining room, home office and youth furnishings. RoomGear, SLF�s newly introduced youth brand, is thoughtfully designed with today�s families in mind. SLF designs, sources and markets furniture for every room of the house, allowing you to pick pieces that display consistent quality, style and design unparalleled in this category. Browse through our collection of Samuel Lawrence Home Furniture below by selecting Bedroom, Dining Room or Kids Room Furniture. If you're looking for a piece of Samuel Lawrence Furniture that you don't see on our website, please call us at 800-269-2216 and one of our friendly staff will help you find exactly what you're looking for at a great price that always includes Free Shipping.